Polar bears have indeed survived at least the last interglacial and probably the previous (between the Holstenian and Wisconsin). However, the warmest annual mean temperature during either of those was about 1 degree celcius warmer than today. Summer temperatures in portions of the Arctic were up to 5-8 degrees warmer, but it is the annual average that is really telling. All available evidence suggests that ample sea ice to support large numbers of bears persisted in both interglacials just as it did in the less warm interglacial between the Wisconsisn glaciation and the Holocene (the interglacial we are in right now). Mark and Amstrup agree then, that during the Eemian (aka Marine Isotope Stage (MIS) 5e and the Sangamonian, which lasted from 130,000 to 115,000 years ago and peaked at ~125,000), summer temperatures were 5-8 degrees C warmer in parts of the Arctic and the annual global mean temperature was about 1 degree warmer. Note that the oldest known polar bear fossil dates to this period, from Svalbard (Lindqvist et al. 2010). Amstrup says it’s the annual global mean temperature that counts, not the summer highs. Let’s not quibble with that for the moment: let’s say the important feature of the Eemian was that it was, on average, about 1 degree Celsius warmer than today. However, the essential issue for polar bears wasn’t the average global temperature but rather, what sea ice conditions were like during the Eemian. Amstrup seems to agree because he contends that “all available evidence suggests ample sea ice to support large numbers of bears” existed during the Eemian. He must be talking about winter ice coverage here because all evidence suggests that during the Eemian summer, the Arctic was ice was virtually ice-free (see below) or very nearly so. This strikes me as an oddly contradictory admission from someone who constantly insists that summer ice is critical for polar bear survival but never mind. Winter – at the lowest point, there was no ice in the Bering Sea south of Bering Strait (Polyak et al. 2010:1769). There seems to be no sea ice proxy data (so far) from the eastern Arctic, but the fact that a polar bear jaw bone (mandible) was recovered on Svalbard indicates that sea ice must have reached there at some point (the fossil could not be dated precisely enough to narrow this down, see previous post here). There is no data from Hudson Bay itself but we know the tree line extended well north of its present position near Churchill. In fact, boreal forests extended to Tuktoyaktuk on the Southern Beaufort coast and the southern Arctic Islands, much further north than during the Holocene Optimum (Featured Quote #10; CAPE 2006; Dredge 1990; Nichols 1967). Sea levels were up to 6 m higher (Cutler et al. 2003: Table 2). If the Bering Sea had no ice at the height of the Eemian, southern and western Hudson Bay likely had ice cover for a much shorter period than today – perhaps only January to May vs. the current November to July coverage (see post on Hudson Bay geology). I suggest it is doubtful that polar bear females made maternity dens on the shores of southern and western Hudson Bay as they do today but they may have hunted in the southern bay in the spring when ice was at its maximum extent. Foxe Basin (see Fig. 1) may have been the furthest south females could reliably den in Hudson Bay during the Eemian, but that’s a guess. Summer – at the lowest point, essentially “ice-free” conditions existed during the Eemian (Polyak et al. 2010), which means all but a thick band of multi-year ice north of the Queen Elizabeth Islands, Ellesmere Island and Northwest Greenland persisted (even in modern parlance, “ice-free” means a decline to “less than 1 million square km”). 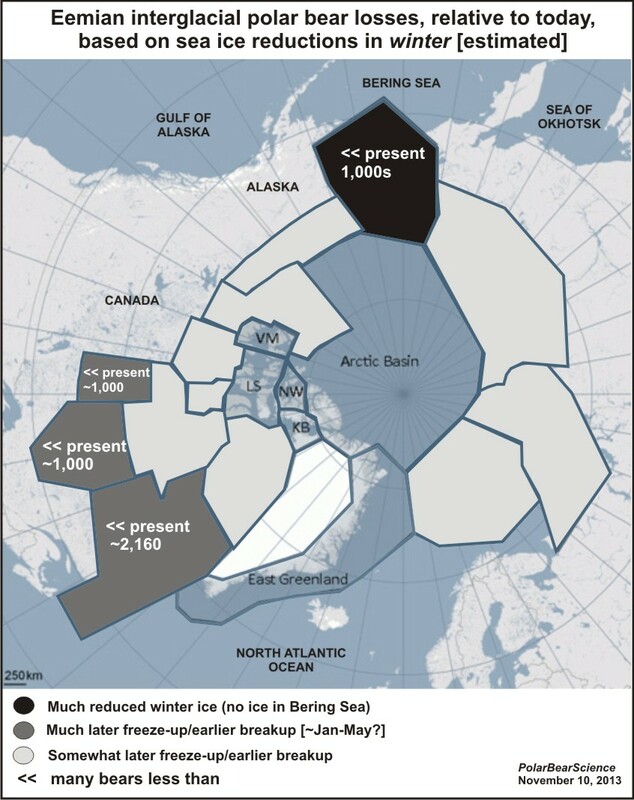 While a recent study by Bauch et al 2012 (press release and pdf here) vaguely argues against ice-free summer conditions, the study contradicts evidence from a number of other Arctic locations. It’s a moot point for this discussion, however, because as Amstrup insists, winter ice coverage was the significant value for polar bears. The bottom line is this: it was much warmer in the Eemian than it is now – much warmer even than the Holocene Optimum – and that minor-sounding “1 degree C” difference resulted in significantly less winter ice and even less summer ice than we have today. 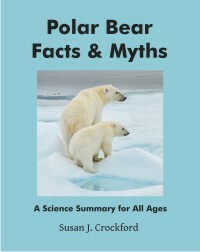 I will not dispute that during the Eemian there was almost certainly enough ice present in winter to support a viable population of polar bears, perhaps even a fairly large one – we would not have polar bears today if that had not been the case – but Amstrup misleads the public by implying that Eemian sea ice changes did not represent a significant departure from modern polar bear habitat (see Fig. 1) and that polar bear populations were not appreciably smaller than today. Figure 1. Estimated relative losses in abundance in current polar bear subpopulation regions at the height of the Eemian interglacial, ca. 130,000-115,000 years ago, due to declines in winter ice coverage. There was no ice in the Bering Sea in winter in the Eemian (Polyak et al. 2010), almost certainly causing a dramatic drop of polar bear numbers in the Chukchi Sea subpopulation. There was almost certainly a markedly shorter sea ice season in Southern and Western Hudson Bay, and in Davis Strait, resulting in marked local declines in polar bear numbers. Populations elsewhere may have declined (due to somewhat shortened ice seasons) or increased due to immigration from other regions but overall, the population was still remarkably large. Amstrup does not define what he means by a “large” population but my guess is that this comment is based on the work of a single group of geneticists, Miller et al. 2012 (PNAS), who made a guess about changes to “effective population size” (i.e., not the total size) of polar bears during the Late Pleistocene. This effective population size estimate was generated with a computer model, based on very limited genetic data, but it’s the only evidence we have regarding past population sizes. Considering how many other dubious assertions Miller and colleagues made in their analysis (discussed previously here), I don’t have a great deal of confidence in the actual figures they use in their graph, but the relative differences (gross changes) are probably valid. Their models put early Eemian polar bear effective population size below current levels but well above early-mid 20th century values. That suggests that a one degree Celsius rise in global average temperature (associated with a significant contraction of winter sea ice) had less of an impact on polar bear numbers than the pre-1970s slaughter of bears. 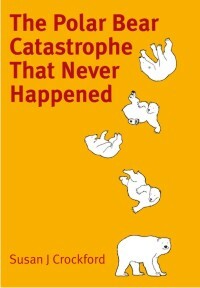 If correct, it means that the Eemian polar bear population was considerably smaller than today. This is evidence that was not available in 2008 when polar bears were listed as “threatened” with extinction based on predictions of future sea ice loss (US Fish & Wildlife 2008). In other words, polar bears survived the Eemian with a population that had to have been many thousands of bears smaller than today but they were nowhere near extinction. Amstrup says as much and I agree. However, Amstrup rails constantly at summer breakup of western and southern Hudson Bay sea ice a few weeks earlier than the 30 year average but here he dismisses as inconsequential the total loss of Bering Sea winter ice during the Eemian. Go figure. Amstrup says “the current warming is not a cycle…” The Eemian warming had a different cause, he says, than what’s happening today. I say, for polar bears, it doesn’t matter. The amount of ice loss is what matters to polar bears. I think it’s important to understand why Amsturp and his colleagues are so dismissive about polar bear survival through the Eemian and to do this, I have to discuss their models — but I’ll keep it short and simple. What you need to know is that the future polar bear survival models generated by Amstrup and his colleagues (e.g., Amstrup et al. 2008, 2011; Durner et al. 2009; Obbard et al. 2010) predicted that a 1 degree increase in global temperature would have a much less profound effect on sea ice habitat than the Eemian actually experienced. Something approaching the Eemian sea ice situation (approximated in Fig. 1), with no ice in the Bering Sea in winter, occurs in only a few of the model runs (Fig. 2). Those ice-free [winter] Bering Sea projections do not appear until the end of the 21st century and assume that global temperatures would have increased by almost 3 degrees Celsius by that time (Durner et al. 2009:Fig.8c, using IPCC AR4 (2007) scenario A1B, “business as usual” 1.7-4.4 degree increase, average 2.8). Fig. 2 Excerpt of winter ice projections from Durner et al. 2009 (Figure 8c), showing an ice-free Bering Sea in 2099 (top panel) and a more typical projection for that decade below (for 2091, showing ice south of the Bering Strait). They modeled only Arctic basin populations and sea ice. However, the temperatures are a side issue here – it’s the ice levels that matter. What we have from the Eemian is irrefutable evidence that polar bears are capable of surviving a significant contraction of winter sea ice habitat without getting anywhere close to extinction. In fact, the only evidence we have (from genetics) suggests the population did not drop as low as it did during historic times. Here’s the problem: the polar bear survival models concocted by Amstrup and colleagues predict near-extinction of the polar bear under Eemian-like conditions. Amstrup needs to discount the Eemian evidence of polar bear resilience to fairly profound sea ice changes because it’s concrete proof that these models, which predict the loss of two-thirds of the world’s polar bears by the middle of this century, are worthless. Nichols, H. 1967. Central Canadian palynology and its relevance to Northwestern Europe in the late Quaternary period. Review of Paleobotany and Palynology 2:231-243. US Fish & Wildlife 2008. Determination of threatened status for the polar bear (Ursus maritimus) throughout its range. Federal Register 72 (95):28212-28303. 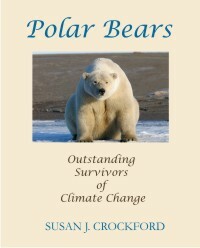 This entry was posted in Evolution, Population, Sea ice habitat and tagged Amstrup, average global temperature, Bering Sea, computer models, Eemian interglacial, effective population size, extinction, Hudson Bay, Miller, MIS 5e, polar bear, Polar Bears International, Sangamonian, sea ice extent, summer ice minimum, threatened. Bookmark the permalink.